Here’s the good news: Analysts are predicting that this will be the best holiday season for retailers since 2008. This year, consumers plan to spend an average of $636 on their holiday purchases, according to The NPD Group’s 2016 Holiday Purchase Intentions Survey. That’s 3% more than last year. The National Retail Federation predicts a similar increase (3.6%) in sales during November and December which would bring the size of the total sales in those key months to $655.8 billion. What’s more difficult to predict is exactly where and how consumers will choose to shop this holiday season. Multi-touch, multichannel shopping has become the norm. Buyers can research, compare, and order gifts from almost anywhere. Each time a shopper sees your product and brand on a digital device or in a store you have a chance to win or lose a sale. If last year is any indication, nearly 40% of the online holiday spending to be through Amazon. We’ve shared advice before how to make your impact on the online retail giant. There are four other new trends to consider when planning your go-to-market strategies from now until Christmas. 1. 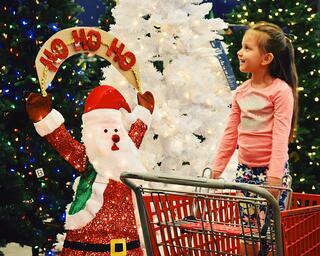 More bargain hunters started shopping early than ever before. The NRF found a record high number of shoppers (34 million) reported kicking off their holiday shopping in August and September. This group tends to be older, wealthier, college-educated, and female. 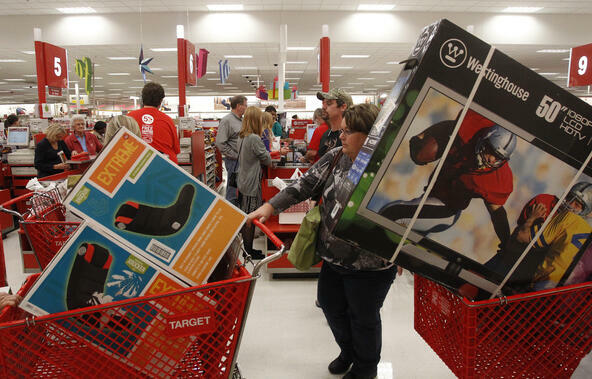 Bargain hunters watch for deals and deep discounts for months and are not willing to wait until last-minute scrambles at Black Friday sales. The group has grown in size and influence in the aftermath of recession and recovery when they learned to hunt for deals, and more and more coupon sites and deal programs emerged. What it means for you: This early bird group is largely moved on price, the core way to compete for their business is with deep discounts. If bargain hunters are an important market for you, provide them tools to price check so they have the confidence and incentive to buy from you. However, if this is not your ideal shopper, there's still a takeaway. There is some benefit to knowing that many of the price-conscious shoppers have already checked off must-haves on their holiday shopping list. Brand experiences, convenience and personalized experiences are winning over the rest of the market over a simple price cut. 2. Brick and mortar shopping is now an experience, not a necessity. 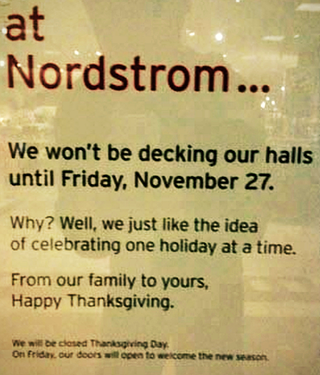 The Nordstorms window sign below is just one example of stores this year choosing to close on Thanksgiving Day. In fact, the Mall of America, along with retailers Staples, REI, The Home Depot, Lowe’s, BJ’s Wholesale Club, Costco, Sam’s Club, Petco and Crate and Barrel are all planning on closing for the holiday. See the full (and growing) list on TheBlackFriday.com. 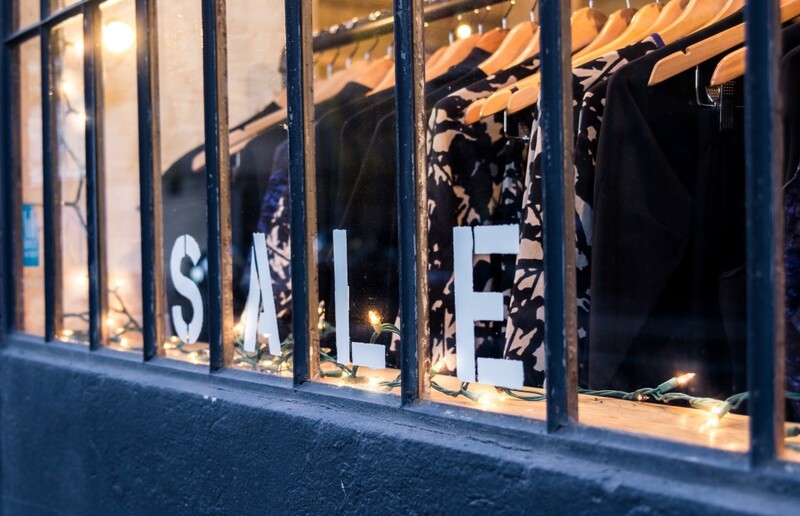 US retail foot traffic to brick-and-mortar stores suffered a year-over year dip of nearly 10% this May while online shopping continues to grow. But limited traffic isn’t the only thing driving the decision, what’s unique this year is the explicit statement many are making that ties back to brands in support of time with family. What it means for you: The traditional pattern of long lines on big sale days and scrambles for sale items will be less dramatic this year. In-store retail is by no means dead, it’s nature is merely changing. More shoppers are going to stores armed with digital research expecting a tailored, immersive and curated experience from retailersthey have brand loyalty for. Consider how you can add to the customer experience and value in your vertical. 3. A digital screen is influencing everything your shopper does. Mobile is increasingly bridging the divide between physical and digital commerce. A Facebook IQ study found that 45% of shopping trips include some mobile shopping. Retailers are looking at ways to make the most of this trend. For example, Saks has launched a digital app specifically for last-minute shoppers who need a gift when the cutoff date for holiday shipping has passed or who might have previously abandoned an online purchase. Target began an initiative to improve the in-store consumer experience. The big box retailer used mobile beacon technology to provide customers with deals and recommendations as they browse physical aisles. What it means for you: What matters in mobile is relevance in the micro-moment a customer reaches for their phone. Giving customers the option to save their preferences, using their geographic data in an intelligent and natural way and using push notifications in a way that improves shopping experiences and convenience can be key differentiators. If you are a brand manufacturer working with a retailer that has built mobile experiences, it’s important to understand the specific content requirements they have so your brands can surface to the top of mobile searches. 4. Last-minute delivery options are increasingly competitive. The fulfillment and shipping capabilities of retailers and business-to-business (B2B) merchants continue to expand. Fifty-four percent of US retailers had a last-minute delivery cutoff date of December 21 or later in 2015, up 38.9% the previous year. In fact, 3.2% of retailers and merchants surveyed were able to fulfill online orders as late as Christmas Eve. In addition, many stores began expanding their “click and collect’’ offerings, which let shoppers buy a product online and pick it up in store. Many are planning on having designated traffic lanes for pick up with additional staffing to meet the demand for click and collect services. What it means for you: Last-minute shoppers can be even more last minute this year, particularly when it comes to online shopping. Make sure your products are winning traffic and your product pages are driving conversions. We have some suggestions on how to improve performance on your product pages. While it’s clear the consumer is in charge. The challenge for brands and retailers to drive demand for products on a digital screen. Director of Global Ecommerce Neil Ackerman has tackled this challenge for Mondelez International, makers of Oreo, Chips Ahoy, and Trident Gum. Its brand, belVita, saw double-digit increased sales conversiondue to a shift in focus on product content. He'll share his insights and advice for your brand during our upcoming webinar. Learn more.